Hard Drive Degausser. Powerful 12,000 Gauss (1.2 Tesla) magnetic field remove data permanently from all ATA, SCSI, SAS, SATA, FC hard disk & tape in 1 second! No Electricity or Maintenance required. 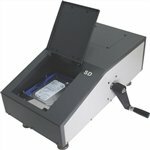 The Model SD-1 is capable of completely erasing all data on magnetic media devices such as PMR and LMR Hard Disk Drives, Hard Drives (3.5", 2.5", 1.8", 1.0"), Tape (DAT, 8mm, Half-inch/3480, LTO-1 to LTO-6, QIC, DLT, Travan, AIT) and Floppy Disks. It's Rare Earth Magnet Technology generates NO Heat, No Sound, No EMF (Electromagnetic Fields) and can be used continuously. The Hand Crank design requires no electrical power to operate the unit and is perfect for mobile applications. Degaussing can be complete within 1 seconds with an actual degauss cycle time of 5 second utilizing its 12,000 Gauss fixed magnetic. Go green with the powerful, affordable and easy to use SD-1 to safely and permanently erase your most important asset - your data. Regulations and Compliance Mandates: Many organizations including public and private corporations recommend degaussing for their magnetic media before destruction or recycling. Uses no electricity. Is silent, portable, and needs no cooling time. Mobile and Deployable: This degausser uses permanent magnets and is thus a standalone unit that does not require electrical power. It is fully deployable for on-site and emergency degaussing. If you have any questions about this product by MediaDuplicationSystems.COM, contact us by completing and submitting the form below. If you are looking for a specif part number, please include it with your message.